Katee Kross is joined by Erin Ponsonby for the first edition of Here and Now, Broadcasting Scotland’s new music programme starting this week. Erin Ponsonby is a 19 year old singer/songwriter from Clydebank who released her Debut Single “Want Me Too” on all digital stores/platforms in February 2017. Erin has been gigging for the past couple of years where she firstly supported ‘Into the Ark’ on their UK tour through DF Concerts in The Garage, Glasgow. Since then she has played in many Glasgow venues such as The Barrowlands, King Tuts, Broadcast, The Hug and Pint, Classic Grand (Through ‘Behind the Noise 2015/16’) and The Clutha. Erin supported Hue & Cry in the Beacon Arts Centre in Greenock recently & has a few more exciting gigs lined up. 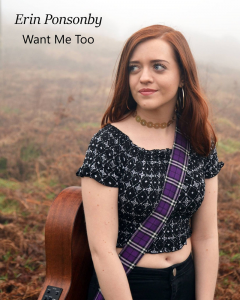 Erin plays regularly with Newborn Sessions and is also studying Music Performance at West College Scotland – As well as this, Erin is a busker in Glasgow and Stirling and is also currently recording her first EP which will be released later this year.